It is that time again; time to look back, just briefly, over the past year. In retrospect, it has been a big year here in the Adirondacks. I was reminded of all the interesting 2008 Adirondack news while crawling through Lake Placid Main Street holiday traffic in the car the other day. I caught an interesting story on North Country Public Radio about the big Adirondack news stories of 2008. 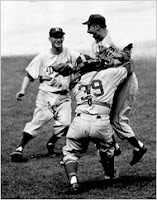 One of the most interesting (to this die-hard baseball fan) Adirondack North Country stories involves the "man who beat the Yankees" in the 1955 World Series. It is a little know fact that Brooklyn Dodgers pitcher, Johnny Podres, member of the famous Boys of Summer, was born and raised in the Adirondacks in Witherbee, New York. His father was a Polish-American iron ore miner and the family lived in the small mining town near Lake Champlain. Adirondack native Johnny Podres was only 23 years old when he helped the Brooklyn Dodgers win their only World Series Championship and was named the first ever World Series MVP. Johnny Podres passed away January 13, 2008 at the hospital in Glens Falls, NY and his passing was one of our Adirondack notable news stories of 2008.